Found myself with three celery roots in the crisper drawer the other day. Also in the fridge: rather too much heavy cream. 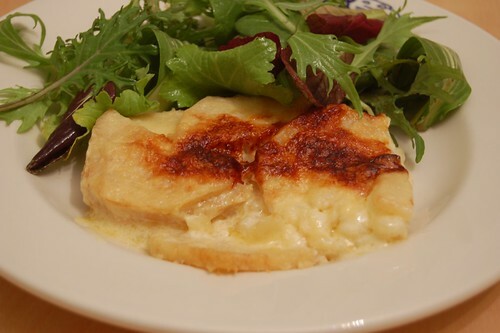 Hence this gratin. Simple, rich, quite tasty as dinner with a salad. I put this in a small 6x8 baking dish but I bet it would scale up well, and next time I have a lot of celery root kicking around, I'm definitely making this again. Put the sliced celery roots in a sauce pan and add enough cream to almost cover them. Season with salt and pepper and bring to a simmer over medium high heat, then reduce the heat and let cook, stirring a couple of times, for 15-20 minutes until the celery root is tender when pierced with a knife. Butter a 2 quart baking dish, and transfer the celery root to the dish. Pour the cream over it, but you might not want to use all the cream - it's ok if the top layer of celery root isn't covered. Shred the cheese and put that on top. Stick it in the oven for 20 minutes, then rotate the pan and cook another 15-20 minutes or until the top is richly browned. Let stand 5-10 minutes (until no longer bubbling), then serve. Last night's dinner. 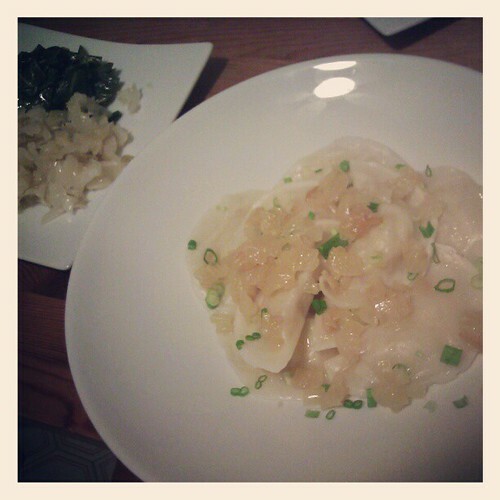 Peirogies, that is, mashed potato inside pasta. From this recipe, served with sauerkraut* and CSA collards, which I braised in leftover corned beef cooking liquid. Just right for yesterday's gray skies. *We have rather a lot of 'kraut kicking around from the fermentation class I taught last week. I sent plenty home with students but I find myself with nearly half a gallon of the stuff. As it is not hot dog season, I'm at a bit of a loss as to what to do with it all. Suggestions? Soup recipes? Help me out, friends. Solo dinner night, so I get to eat pork - hot italian sausage, specifically. But I also found myself with an abundance of creme fraiche, a head of fancy radicchio, and a craving for pasta, hence this dish. Bring a large pot of salted water to a boil. When it's boiling, drop the pasta. Cook until a minute less than it says on the box or until just before al dente. In a large skillet, heat the olive oil over medium high heat and add the green onions, saute 1-2 minutes. Add the sausage, and cook until brown, breaking up into small pieces. Move the sausage and onions to the outside edges of the pan and add the radicchio to the center. Cook until wilted, then stir. Add the creme fraiche, it will melt rapidly, just stir it in. Let the whole mess bubble until thickened, or until the pasta is almost cooked. When the pasta is still firm, use a large slotted spoon or a spider to remove it from the water and add it to the skillet. Stir it all up, let it simmer until the pasta is cooked all the way (less than a minute). 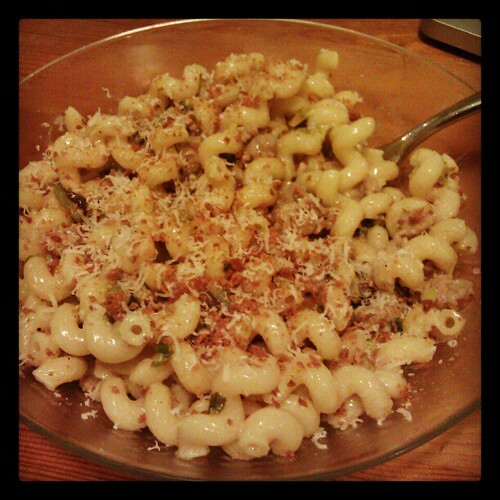 Remove to a plate, top with bread crumbs for crunch and parmesan for added deliciousness. NB: you probably won't need to add salt, given the saltiness of the sausage, but taste it as you go and add salt if necessary. Oof, long recipe title. Tasty dinner, though. We had some chicken thighs that I got super lazy about Sunday night (that is, we got pizza during all the football and didn't eat anything later). So tonight I resorted to my recent favorite chicken cooking method: season, sear, roast. Usually I just season with salt and pepper, cook, and then build a quick sauce in the skillet when the chicken is done (deglaze with wine, add mustard and cream or creme fraiche, whisk). There's nothing wrong with a mustard cream sauce, but tonight I knew I wanted something warmly spicy, and I turned to Ras al Hanout, a North African spice blend. Ingredients vary from blend to blend, and in fact Ras al Hanout is Arabic for "top of the shop" meaning the spice shop owner mixes it from the best things in the shop. Using the old reliable sniff test, I can tell you mine contains cinnamon, coriander and cumin, but probably a few other things too. I know my jar isn't very spicy so I added cayenne for kick, but if you blend your own you can make it as spicy or cinnamony as you like. I found myself with rather a lot of carrots in the fridge, and I thought a warm salad with wilted arugula would be nice, and I just built it as I went. 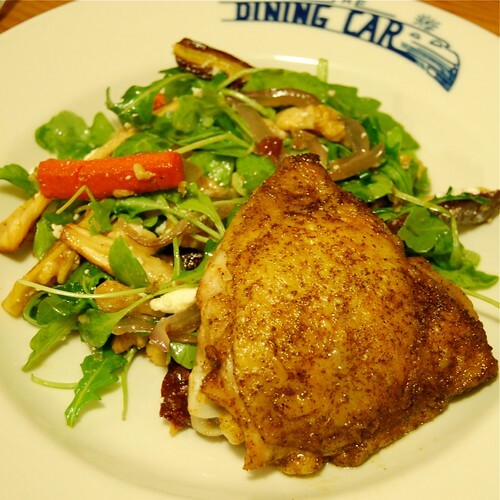 The onion from beneath the chicken brings the flavors from the skillet into the salad and ties the whole thing together. Mix together the olive oil, ras al hanout, salt and cayenne into a thin paste. Rub all over the chicken thighs until thoroughly coated and set aside (don't refrigerate) while you peel and cut the carrots. Toss the carrots with a tablespoon or so of olive oil and a big pinch of salt and pepper, spread on a baking sheet and roast for 15 minutes. Toss to redistribute and see if they're done; they'll probably need another 10 minutes. Meanwhile, heat a cast iron skillet over medium-high heat until almost smoking. Add the chicken (if there's a lot of excess spice paste, leave it in the bowl, but no need to wipe them off or anything), skin side down. It should sizzle aggressively. Cook for 5-8 minutes until it releases easily from the pan. Remove the chicken from the pan and add the onion, then put the chicken back in, skin side up now, more or less covering the onion. I actually just picked up each piece, tossed a quarter of the onion slices under it, and flipped the chicken piece. Put the skillet in the oven and roast until the chicken is cooked through, another 20 minutes or so. A meat thermometer inserted into the meaty part (but not touching the bone) should read 165 or more. Take the chicken out and remove it to a plate to let it rest for 5-10 minutes before eating. If you've timed it right, the chicken and the carrots will be done around the same time. It's ok if they're not, though. If the carrots are done before the chicken you can always stick the carrots back in to warm up while the chicken rests. If the chicken is done first, no worries, it needs to rest. Now we combine the tasty things! Put the arugula and walnuts in a bowl. Add the warm carrots and any carroty roasting liquid amassed on the baking sheet. Scoop the onions out of the chicken pan and add them to the salad, squeeze the lime over the whole thing. Toss to combine. If you need more dressing, scoop some of the liquid from the chicken roasting skillet into the salad. Add the feta and toss gently, and serve. So. I did it again. Last year I was a little frantic about completing NaBloPoMo, but this year I tried to just enjoy it and I was pretty successful. In fact, just like last year, I liked the diversion from my more-or-less standard blog MO. I used to feel bad if I didn't post in the order of photograph, anecdote, headnote, recipe, but I think I'm going to have to let that slide for good. I'll still share recipes, of course, but would anybody mind if I post the occasional photo-only post? Or if every once in a while I tell you what I'm up to at work intead of telling you what I had for dinner? I've been sort of bored with this space lately, which is why I was absent for, oh, all of October, but I think part of it is because the world of food blogs has become so saturated and I can't help but feel competitive. What if my picture isn't as pretty? What if my cookies aren't tied just so with perfect baker's twine or my story isn't as funny/poignant/heartfelt/tearjerking? What if my recipes include weird hard to find ingredients or make too-frequent use of leftovers and what if you don't have the same leftovers? If nothing else, NaBloPoMo has taught me that I still like blogging, even if none of my anything is "as good as" anybody else's. Does that make sense? The point is, I hope to see you here more frequently than I did over the summer. 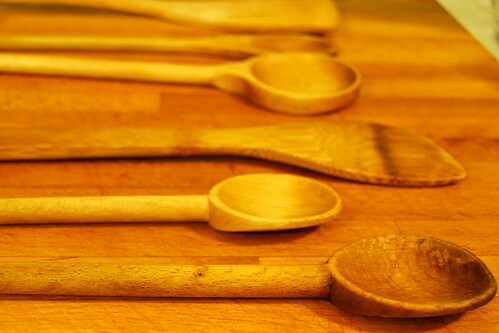 Incidentally, have you oiled up your wooden spoons and cutting boards lately? It's winter, and just like you they could probably use some moisturizer (douse them with mineral oil, wait an hour, wipe off the excess with a paper towel).